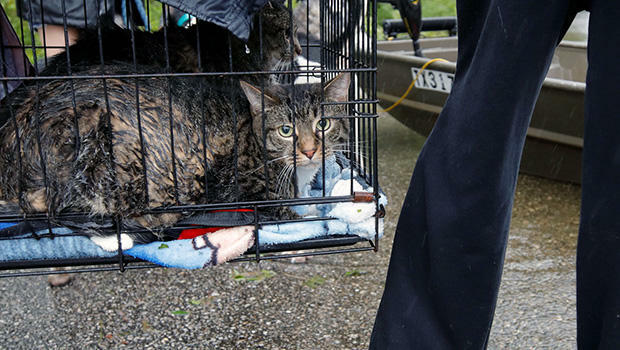 BLADENBORO, N.C. — A woman who took in more than two dozen dogs and cats during Hurricane Florence has been charged with practicing veterinary medicine without a license. Tammie Hedges, founder of Crazy's Claws N Paws animal rescue, was arrested Friday after 27 dogs and cats were confiscated from a temporary shelter. Hedges told the News-Argus of Goldsboro that she felt she had to help the animals brought to her during the storm. "We were trying to help abandoned animals," Hedges said. "A group of us got together to do something to help those animals. [That's] why we opened our building to them, so they'd have a safe dry place to go until their owners returned to get them." Hedges said she gave amoxicillin to some sick animals and also used a topical antibiotic ointment. She's also charged with soliciting a donation of tramadol, a prescription painkiller sometimes used for dogs and cats. In a statement, Wayne County said animal control officers had "serious concern regarding the practice of veterinary medicine without a license and the presence of controlled substances." Frank Sauls, animal services manager for the county, told the News-Argus that "if we didn't feel like anything was being done wrong, we would not have taken [the animals]."